This is hands down the craziest party hostel I’ve ever stayed at. With over 800 beds, there are always hundreds of people to meet every night. Every time you walk into a new dorm, you automatically make 7 new friends who will be your drinking buddies for the night. It’s so catered for parties that they have a central speaker system which reminds everyone to wake up in time for 10am check out! 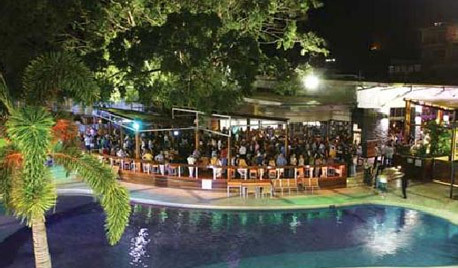 The club at Gilligans is the biggest in Cairns and is full every night following the various themed evening events. There are two levels and a beer garden, and you get cheap drinks for staying there. Each night they have a variety of activities such as Bogan Bingo, international DJ nights, pool parties and wet t-shirt competitions.Just last Friday they hosted one of the biggest paint parties in Australia with Ultraglow. If this wasn’t enough, during the day you can relax by the huge pool and fountain to cure your hangover. 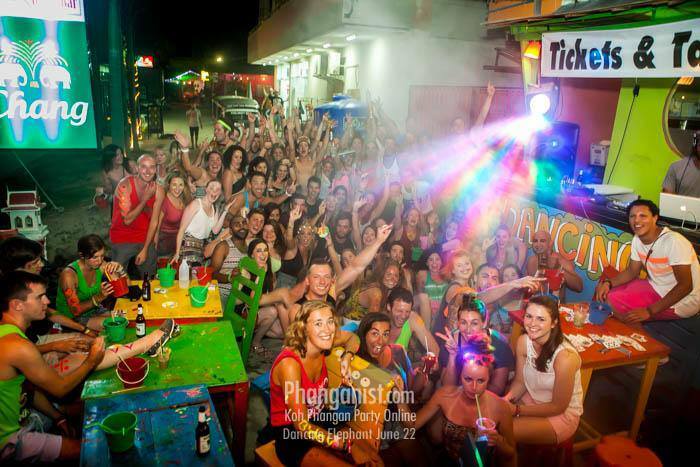 Koh Phangan is the party island of Thailand and home to the full moon parties. They run once a month but there are parties every night in the lead up which are almost just as good. Danging Elephant is set up perfectly and specifically for partying- the forms are 20 or 40 beds and all the mattresses are laid down attached to one another. The rooms are on both sides of a laneway, which turns into a party at night. There is a DJ and bar selling buckets which are cheap and strong. Everyone who stays there starts drinking around 7pm and this is how you meet everybody. Most travellers are there by he selves and that’s why it’s such a sociable hostel. The party raves on with paint and music until morning and they also sell tickets to the pre full moon parties with a discount if you’re interested. They also run a day out on the water on a giant inflatable obstacle course. There is a 5 night minimum stay during full moon week, which turns out great because everyone is there for the same amount of time. By the 2nd or 3rd night you have 50+ friends to dance on the sand with! An added bonus, they have a kitchen which sells incredible thai food to pull you over to the next night’s shenanigans. It’s only a few blocks away from the beach and close enough to be in amongst the parties but far enough to be extremely secure. Hanoi Backpackers Downtown is absolutely pumping every single night. The lobby transforms into a bar and is bartender by backpackers who have gotten stuck there for the past couple of months. 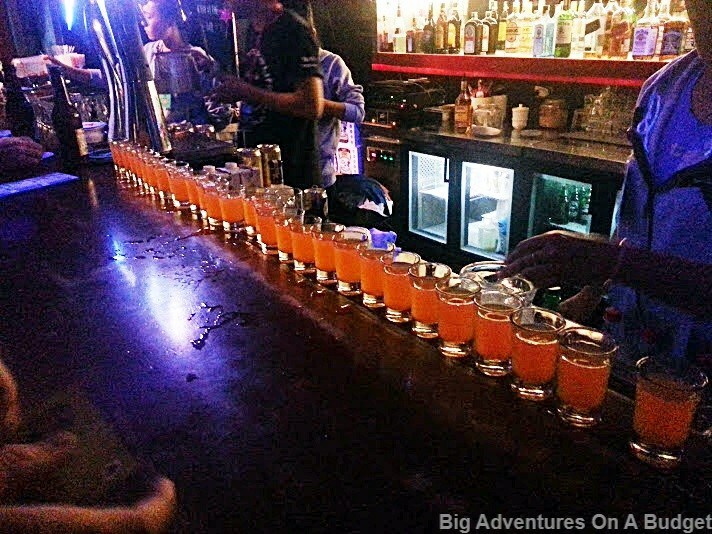 Every night they run a pub crawl starting at the hostel and they even give away fee shots to get you going. It’s incredibly easy to meet people as the set up is several long benches where everyone just slides up and joins one another. Most nights result in people dancing on tables by 10pm and not returning until 6am the next morning. There is usually a group of 50 people or so who go on the pub crawl and by the end you know everyone staying there. If you’re brave you can do the grenade shot at the bar. If your nationality beats the current top records for the night you are put on the blackboard. When I was there we held the high score the entire time. Better yet, the next morning when you’re hungover the restaurant (the same place as the lobby and bar) make incredible hot breakfasts for only a few dollars. This entry was posted in Accomodation, Blog and tagged accommodation, budgeting, hostels, party, pub crawl. Bookmark the permalink. Haha, that is one of the nicest hostels ive stayed at by far!